The territory of Tajikistan has been continuously inhabited since the early Stone Age. The first Central Asian states of Sogdia and Bactria in the first millennium BC , included portions of Tajikistan. The territory was Persian-controlled from the 6th century BC , until conquered by Alexander the Great in 329 BC . Much of Tajikistan was included in the Greco-Bactrian kingdom in 3rd century BC , and after displaced by the Tochari tribes who invaded Sogdia a century later. The Kushana kingdom was established in the first centuries of the Christian era, when a number of cities were established, and agriculture and commerce grew. In the 5th and 6th centuries, parts of Tajikistan were conquered by nomadic tribes, the Chionites and, later, the Ephthalites. At the end of the 6th century the large Ephthalite empire was displaced by the Eastern Turkic Kaganate. Arabs conquered the area in the 8th century, introducing Islam. Later in the 9th century they were displaced by the Samanides, who encouraged the development of trade and of material culture. From the 10th to the 13th centuries a number of kingdoms succeeded one another in Central Asia; among the ones which included parts of Tajikistan were the Ghaznavids, the Karakhanids, the Ghorids, the Karakitai, and the Khwarazmites. In 1219–1221 Genghiz Khan's troops conquered the entire area, destroying many cities. 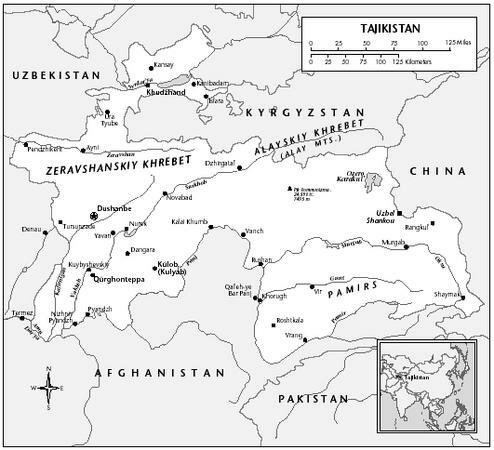 Tajikistan became part of the lands given to Genghiz Khan's son, Chagatai. In the 14th century Timur (Tamerlane) created a large empire, with its capital in Samarkand. In the 16th century Tajikistan was conquered by the Sheibanids, who had their capital in Bukhara. Portions of territory were included later in the Ashtarkhanid state and then in the Kokand Khanate, which emerged in the Fergana Valley in the mid-18th century. Present-day Tajikistan was split between the Khanates of Bukhara and Kokand in the 18th and 19th centuries. In 1863, Russia asserted a right to exercise dominance in Central Asia, and began the military conquest of the khanates. Bukhara and Samarkand were incorporated into Russia in 1868. Kokand was eliminated in 1876, and the border with Afghanistan was set by accord with England in 1895. At that point, part of Tajikistan was in the Emirate of Bukhara, part was in Turkestan. When the Tsar's draft call-up of 1916 was announced, rebellions broke out all over Central Asia, including in Tajikistan. These were suppressed, at great loss of life. Northern Tajikistan was conquered by the Bolsheviks in 1918, who extended control to the rest of the country when Bukhara was captured, in 1920. Muslim guerrilla warfare termed the Basmachi Rebellion was finally suppressed in 1924. Tajikistan was established as an autonomous republic within the Uzbek Soviet Socialist Republic in 1924. The republic became a full Soviet Socialist Republic in 1929. Border delineations in Central Asia were very arbitrary. For several hundred years educated Central Asians had used Persian and Turkic languages essentially equally, so that separation into Turkic-speaking Uzbeks and Persian-speaking Tajiks, as if to create separate nationalities, was primarily administrative. Bukhara and Samarkand, the major Tajik cities, were included in Uzbekistan, while Tajikistan was left only with smaller cities, and little arable land. People were forced to assume one nationality or another. In the late Soviet period Tajikistan was the poorest and least developed of the republics. It comprised four separate areas, the elites of which competed for power. Traditionally power was held by people from Khojent, which is geographically and culturally closest to Uzbekistan's Fergana valley. They were contested by families and clans from Kulyab, south of Dushanbe. Poorest were people from the Gorno Badakhshan Autonomous Province, most of which is in the Pamir Mountains. The final area was Kurgan-Tyube, in the extreme south, where the influence of Islam was strong; public calls for establishing an Islamic state were heard there as early as 1976. In 1985, Mikhail Gorbachev replaced longtime republic leader Rakhmon Nabiyev with Kakhar Makhkamov, whose control never penetrated to the most local levels. Riots in February 1990 exposed his weaknesses, and encouraged a proliferation of political parties and groups. When the August 1991 Soviet coup attempt came, Makhkamov was the only republic leader to welcome it. When the coup failed, Makhkamov was forced to resign, and Nabiyev returned to power. LOCATION: 15°0′ N ; 39°0′ E. BOUNDARY LENGTHS: Total boundary lengths, 3,651 kilometers (2,269 miles); Afghanistan, 1,206 kilometers (749.4 miles); China, 414 kilometers (257.3 miles); Kyrgyzstan, 870 kilometers (541 miles); Uzbekistan, 1,161 kilometers (721.4 miles). The republic declared independence on 9 September 1991, and presidential elections were hotly contested 27 October 1991. Nabiyev used communist control of the media and cells in the workplace to influence the election. Despite this influence, his opponent Davlat Khudonazarov, a popular filmmaker, received more than 30% of the vote. Opposition to Nabiyev continued, however, resulting in massive demonstrations and the formation of a national guard by Nabiyev and militias by the oppositionists. In April 1992, demonstrators for and against Nabiyev took over two public squares in Dushanbe, about a mile apart. Clashes between the two caused several deaths, and tensions mounted. In May, the Russian garrison in Dushanbe stepped in to mediate tensions, brokering a compromise that called for Nabiyev to form a coalition government in which one-third of the ministerial posts would go to oppositionists. Nabiyev named his supporter, Akbarsho Iskandarov, the new legislative speaker to help form a coalition government, and brought token democrats and Islamists into the government, including Kazi-kolon Khojiakbar Turajonzoda, the senior Muslim cleric in the republic. Civil disorder grew throughout summer 1992. In August 1992, Nabiyev was seized at gunpoint and forced to resign, and Iskandarov assumed control of the government. By this time full civil war had erupted, with thousands of casualties. In November, Iskandarov gave up his efforts to govern, and Uzbekistan and Russia joined in the efforts by hard-liners to drive the Iskandarov government and its supporters out of the country, mostly into neighboring Afghanistan. The rump Supreme Soviet, dominated by hard-liners, met in Khojand, and Imomali Rakhmonov became the leader. Rakhmonov, a Kulyabi, was a former collective farm chairman linked to a major hard-line warlord. Kulyabi and Khojenti hard-liners, assisted by Uzbekistan and Russia, launched a successful counteroffensive that by the end of 1992 had resulted in 20,000-40,000 casualties and up to 350,000 refugees or displaced persons, about 80,000 of whom fled to Afghanistan. In 1993, the Commonwealth of Independent States (CIS) authorized "peacekeeping" in Tajikistan under the auspices of its Collective Peacekeeping Forces (CPF) treaty to protect what Russia terms "CIS borders." CPF consisted of Russia's 201st Rifle Division, based in Tajikistan, and token Kazakh, Kyrgyz, and Uzbek troops (the Kyrgyz and Uzbek troops pulled out in 1998–99). Russian media reported in late 1999 that there were about 20,000 CPF, border, and other Russian troops in Tajikistan. The commander of the CPF troops in August 1999 stated that the role of his forces had largely shifted to the delivery of humanitarian cargos, clearing mines, and giving medical assistance. Nonetheless, plans to withdraw the CPF have not been announced, perhaps because in April 1999, Russia and Tajikistan signed a basing agreement for the 25-year presence of Russian troops. After Tajik government and opposition emissaries agreed to a cease-fire in September 1994, the UNSC formally established a UN Mission of Observers in Tajikistan (UNMOT) in December 1994 with a mandate to monitor the cease-fire, later expanded to investigate cease-fire violations, monitor the demobilization of opposition fighters, assist ex-combatants to integrate into society, and offer advice for holding elections. The UN reported in late 1999 that UNMOT comprised 167 civilian staff and 37 military observers. The mission successfully accomplished its assigned tasks and on 15 May 2000 its mandate was terminated. In November 1994, Rakhmanov held presidential elections in an attempt to legitimize his government. The main Tajik opposition groups boycotted this election and a constitutional referendum because they had no say in drawing up the draft constitution and would not be allowed to field their own candidates. Only one candidate besides Rakhmanov was permitted to run, Abdumalik Abdullojanov, a prominent politician in the northern Leninabad region and a former Tajik prime minister. Rakhmanov was elected president by a wide margin and his constitution was overwhelmingly approved. The Organization for Security and Cooperation in Europe (OSCE) declined to send monitors because it viewed the electoral process as not meeting its standards. Elections to a new 181-member legislature took place in February 1995. Four parties were allowed to compete, but restrictive nomination procedures ensured that about 40% of candidates ran unopposed. The election excluded virtually all opposition parties, and Western groups refused to monitor the "seriously flawed" vote. In December 1996, the two sides agreed to set up a National Reconciliation Commission (NRC), an executive body composed equally of government and opposition emissaries. On June 27, 1997, Rakhmanov and United Tajik Opposition (UTO) leader Seyed Abdullo Nuri signed the comprehensive peace agreement, under which Rakhmanov remained president but 30% of ministerial posts were allocated to the opposition and Nuri headed the NRC. As part of the peace process, in early September 1999, the Tajik legislature set presidential elections for 6 November 1999. Only after a popular referendum approved constitutional changes in late September, however, were the opposition Islamic Renaissance and Democratic parties legalized and allowed to gather 100,000 signatures to register nominees. Nominees complained that they did not have enough time to gather signatures and that Rakhmanov's appointees at the local level blocked signature-gathering. The Central Electoral Commission (CEC), controlled by Rakhmanov, then pronounced him the only candidate. This prompted the resignation of opposition members of the NRC and calls for an electoral boycott. To provide the gloss of a multi-candidate race, the CEC "registered" IRP nominee Davlat Usmon, though he refused to run. The CEC announced that 98% of 2.85 million Tajiks had turned out and 96.9% had voted for Rakhmanov, and only 2% for Usmon. Seeking to avert renewed civil war, Nuri agreed on 5 November to respect the outcome of the election and rejoin the NRC in return for pledges by Rakhmanov to allow fair legislative elections that were held in March 2000. On 26 March 2000, Tajikistan disbanded its National Reconciliation Commission (NRC), created to implement 1997 peace accords ending the civil war. The accords set legislative elections held in March as the culmination of the peace process. Former rebel Seyed Abdullo Nuri, chairman of the NRC, called for quick settlement of remaining peace issues. The UN Security Council on 21 March praised the legislative elections and work of the NRC, and withdrew UN observers in May 2000. Although benchmarks of the peace process have been largely met, including the return of refugees, demilitarization of rebel forces, legalization of rebel parties, and the holding of presidential and legislative elections, stability in Tajikistan remains fragile. The Islamic Movement of Uzbekistan (IMU), a radical Islamic organization seeking to establish an Islamic state in Central Asia, carried out operations in Tajikistan in the summer of 2000. Tajik authorities increased the number of customs checkpoints and deployed additional military troops to prevent the infiltration of Islamic militants. In addition to the IMU, the Hizb-ut-Tahrir ("Freedom Party"), another radical Islamic organization, operates in the country, although unlike the IMU, it is non-violent. Following the 11 September 2001 terrorist attacks on the United States, and its subsequent military campaign in Afghanistan to oust the Taliban regime and al-Qaeda forces, all radical Islamic groups in the Central Asian nations were linked to terrorism. Tajikistan became a strategic partner in the US-led anti-terrorism campaign when it offered the use of its airports. Leaders of Tajikistan's opposition Islamic Renaissance Party (IRP) have vigorously denied Rakhmanov's claim that it promotes extremism, and accuse him of using the US-led campaign against terrorism to neutralize his mainstream Islamic political opponents. In April 2001, Rakhmanov and Russian President Vladimir Putin agreed on the establishment of a 3,000-man tactical air base in Tajikistan. Russia announced it would increase its border troops along the Tajik-Afghan border. It is Russia's goal to establish a rapid reaction military presence in Central Asia.